The numerous benefits of Cryogenic processing are well documented in scientific literature. 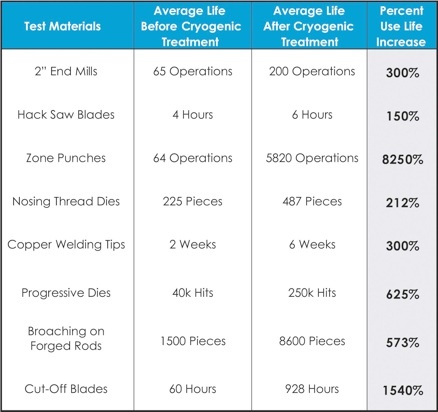 Results from a major university study, presented in this chart show that the process has incredible effects on tool life. Down River Cryogenics builds upon this research with our proprietary process and proven record in real-world applications. What started in a NASA lab is now available to you. Cryogenics has been validated by scientists all over the world. 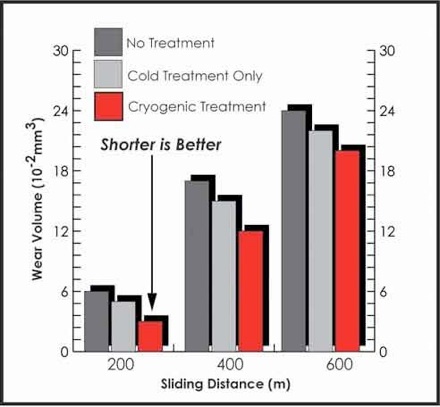 As this graphic from Japan’s Muroran Institute shows, cryogenics provides a huge decrease in wear volume as observed in sliding distance tests. In plain English, this means your tooling will last longer and wear better. The following represent the proverbial “tip of the iceberg” in terms of peer-reviewed objective science studying the benefits of cryogenic processing. Our purpose here is not to explain the metallurgy (contact us, we’ll be glad to), but to show that cryogenics is a well-established, scientifically valid process.